THis is a beautiful picture, just like the other ones that you uploaded! My most favorite scan. Thanks again for sharing this. XD LOVING IT! man it suits the atmosphere. I wish i had the calandar but thanks for sharing. 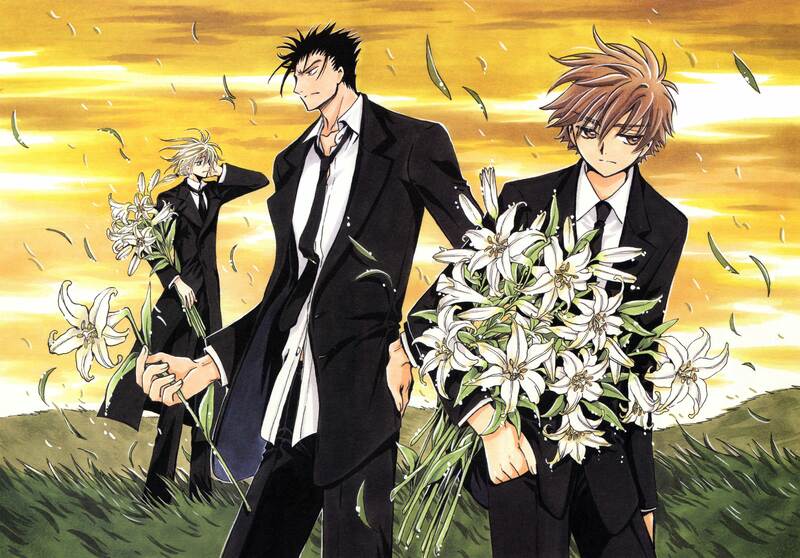 The Tsubasa boys looks so handsome and pensive in this one... great scan! They all look so good in here. The background scene is just like icing on a wedding cake. The grass and sky and pretty much everything is so amazingly detailed. The flowers are so beautiful and real, I just wanna reach through and take some to put in some glass vases around a mansion! But the best part by far is the emotion. It's so nostalgic and sad, but they're expressions are both sad and strong at the same time. I really like the look on Syaoran because it's always so different from the other syaoran, but the same as well. And it's frozen, too. But anyway I just love this wall. Thank you for posting it. Ah, such a sad picture but... it's so beautiful... they're so handsome too... thanks for posting this! SYAORAN LOOKS GORGEOUS! SOOOOOO LOVELY! LOVED IT! THANK YOUUUUUUUUUUU! Syaoran looks... sorta scary but beautiful at the same time. I love how clamp can really get the face and emotions right. Thank you for the uploads! this picture is very beautiful, I love it a lot. This always makes me sad when I see it. It feels like a funeral. And since Sakura isn't in the picture, it feels like Sakura's funeral. whoo. those boys~. Thanks for the pic.